At the ESO’s observatories located high in the Atacama Desert of Chile, amazing images of distant objects in the Universe are captured on a regular basis. But in January 2015, ESO photo ambassador Petr Horálek captured some amazing photos of much closer phenomena: red sprites flashing in the atmosphere high above distant thunderstorms. The photo above was captured from ESO’s Paranal Observatory. 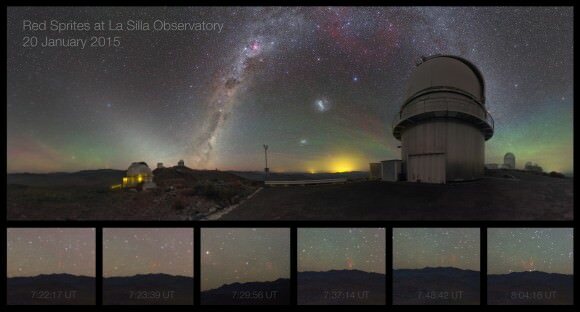 A few days earlier during the early morning hours of Jan. 20 Petr captured another series of sprites from the La Silla site, generated by a storm over Argentina over 310 miles (500 km) away. So-named because of their elusive nature, sprites appear as clusters of red tendrils above a lighting flash, often extending as high as 55 miles (90 km) into the atmosphere. The brightest region of a sprite is typically seen at altitudes of over 40-45 miles (65-75 km). Because they occur high above large storms, only last for fractions of a second and emit light in the portion of the spectrum to which our eyes are the least sensitive, observing sprites is notoriously difficult. These furtive atmospheric features weren’t captured on camera until 1989. Continuing research has since resulted in more images, including some from the International Space Station. When they are spotted, sprites – and their lower-altitude relatives blue jets – can appear as bright as moderate aurorae and have also been found to emit radio noise. It has even been suggested that looking for sprite activity on other planets could help identify alien environments that are conducive to life. Find out more about sprite research from the University of Alaska Fairbanks, and check out the PBS NOVA program “At the Edge of Space” below about a sprite hunt in the skies over Denver, CO conducted by a team of American scientists and Japanese filmmakers. Look! Fast! Sprite lightning occurs only at high altitudes above thunderstorms, only last for a thousandth of a second and emit light in the red portion of the visible spectrum, so they are really difficult to see. But one of our favorite astrophotographers and timelapse artists, Randy Halverson captured sprites during a recent thunderstorm in South Dakota. But wait, there’s more! In his timelapse video, above, you’ll also see some faint aurora as well as green airglow being rippled by gravity waves. More sprites with airglow and gravity waves over South Dakota on August 20, 2014. Credit and copyright: Randy Halverson. See more images and information about Randy’s fun night of observing these phenomena on his website, dakotalapse. When we first checked in with graduate student and astrophotographer Jason Ahrns earlier this month, he had the chance to be part of an observing campaign to try and photograph red sprite lightning from the air. Using a special airplane from the National Center for Atmospheric Research’s Aircraft Facility in Boulder, Colorado, Jason was part of a team that used high-speed video cameras and digital still cameras to learn more about this mysterious lightning. They flew over the central part of the US, such as over Colorado, Nebraska, and Oklahoma. Named for the mythological sprites, which were known for being elusive, this lightning flashes quickly at high altitudes of 65-75 km (40-45 miles), but often as high as 90 km (55 miles) into the atmosphere. They are difficult to see from the ground, thus this airborne observing campaign. 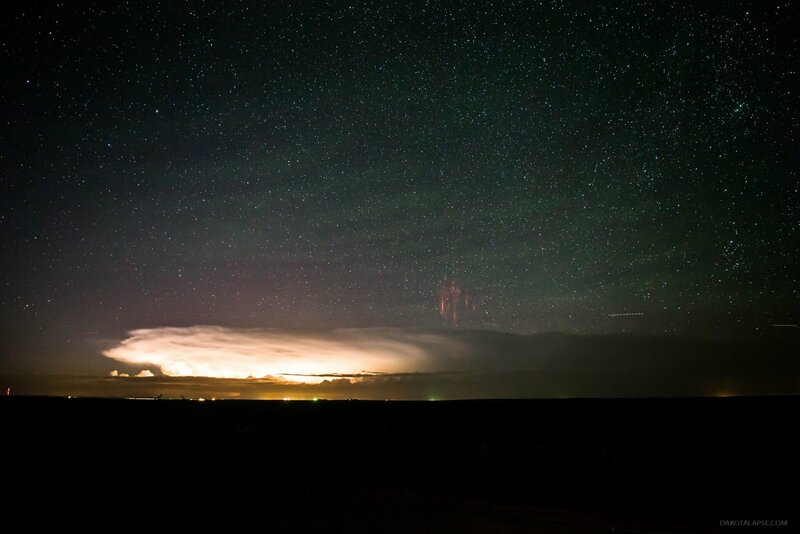 Red sprite lighting, taken on August 12, 2013 over Red Willow County, Nebraska, US as part of a sprite observing campaign. Credit and copyright: Jason Ahrns. Sprites appear as luminous reddish-orange flashes, and sometimes look like jellyfish with “legs” that reach down into the clouds. Besides the columnar shapes, they also can be shaped like carrots and crowns, but why they take different shapes is unknown. They are thought to be triggered by the discharges of positive lightning between an underlying thundercloud and the ground. They were discovered by accident in 1989 when a researcher studying stars was calibrating a camera pointed at the distant atmosphere where sprites occur. Sprite lighting, taken on August 12, 2013 over Red Willow County, Nebraska in the US. Credit and copyright: Jason Ahrns. See more information and images/videos on Jason’s Flickr page and his website. Mysterious red sprite lightning is intriguing: sprites occur only at high altitudes above thunderstorms, only last for a thousandth of a second and emit light in the red portion of the visible spectrum. Therefore, studying sprites has been notoriously difficult for atmospheric scientists. Astrophotographer Jason Ahrns has had the chance to be part of a sprite observing campaign, and with a special airplane from the National Center for Atmospheric Research’s Research Aircraft Facility in Boulder, Colorado, has been on flights to try and observe red sprite lightning from the air. Scientists say that while sprites have likely occurred on Earth for millions of years, they were first discovered and documented only by accident in 1989 when a researcher studying stars was calibrating a camera pointed at the distant atmosphere where sprites occur. Sprites usually appear as several clusters of red tendrils above a lighting flash followed by a breakup into smaller streaks. The brightest region of a sprite is typically seen at altitudes of 65-75 km (40-45 miles), but often as high as 90 km (55 miles) into the atmosphere. Some of the latest research shows that only a specific type of lightning is the trigger that initiates sprites aloft. You can read more (and see more images) about Jason’s experiences with sprites at his website.